Chocolate and special occasions seem to go hand-in-hand! A party just isn't complete without a little bit of chocolate! So, why not celebrate every special celebration for an entire week - 7 days to go! The Madelaine Chocolate Company recently launched their new line of chocolate countdown greeting cards – 7 days to go! They bring together the fun of greeting cards and chocolate, talk about the perfect combination! Thursday is my kids last day of school, so I let them use these fun 7 days to go! cards to countdown their last week of school. Perfect for Birthdays, Anniversaries, Holidays, Parties, Weddings, Graduations, or any other special event that holds excitement or anticipation. 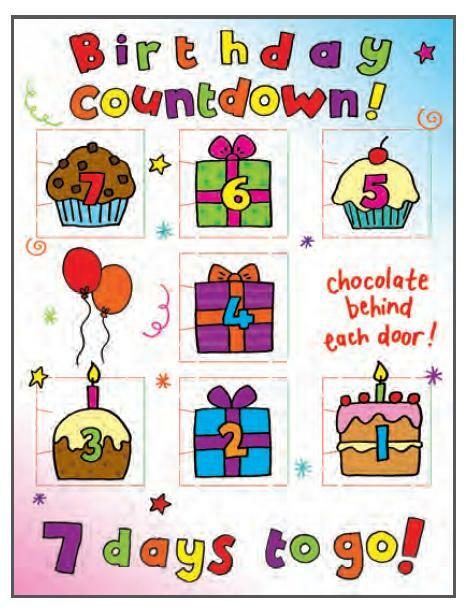 These chocolate countdown greeting cards can also be used as unique invitations and reminders. day of the countdown brings something sweet. The Madelaine Chocolate Company carries a wide assortment of chocolates for just about every season, holiday, sport or occasion. I've had the pleasure of trying a variety of chocolates from The Madelaine Chocolate Company, and the experience has always been the same - pure delight! Their chocolates are not only fun and festive, they are also smooth, creamy and delicious! Next month, watch for a fun Baby Shower chocolate assortment review and giveaway! This giveaway will end June 27th at Midnight EST. Disclaimer: I received a complimentary chocolate countdown greeting card samples from The Madelaine Chocolate Company for the purpose of writing a review and hosting a giveaway. Regardless, I only recommend products or services I use personally and/or believe will be a good fit for my readers. The views and opinions expressed on this blog are purely my own. Results may vary. No monetary compensation was received. The Peanut Butter & Carmel Duets look so yummy. Thanks for the giveaway! great for christmas and the kids! I like the Crayon Box chocolates. i would love to try the solid milk chocolate butterflies! Oh, I'd want chocolate butterflies...yum. I'd like to try the Chocolate Bumblebees and the Butterflies! I would love the Ladybugs! I learned they are a Made In the USA company! I love that!